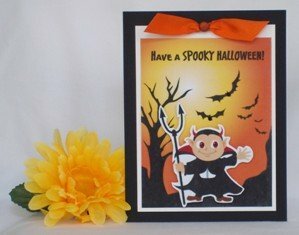 Here are some simple Halloween card ideas using die-cuts. Making Halloween cards with a pumpkin image is traditional. Use paper stacks that have coordinating paper to make it easy on yourself. Sometimes my challenge when mixing paper patterns is trying to match the colors but with coordinating paper, it's done for you. This card is pretty simple to make. 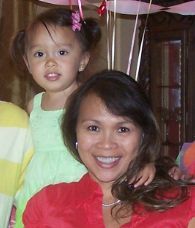 You just have to find the right sized sticker, die-cut shape or stamp for your feature. Add ribbons and gems for your embellishments. Green paper helps the orange from the pumpkins "pop" and a black card creates a contrasting border. 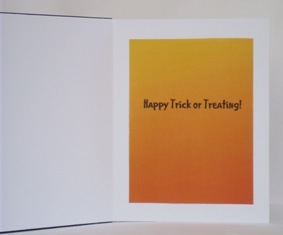 Another idea is to use a greeting card software program for your Halloween cards. Making Halloween cards with a program called e Card Wizard is fun and easy. 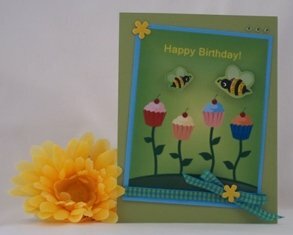 For more handmade card ideas, I turned to a software program called e Card Wizard to help me with my homemade card ideas. 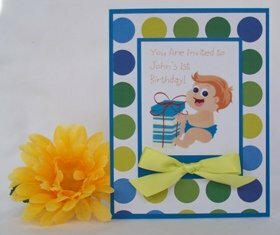 I love this program because it has tons of card templates you can print instantly or if you want to design your greeting cards, it's flexible enough that you can make your own design. 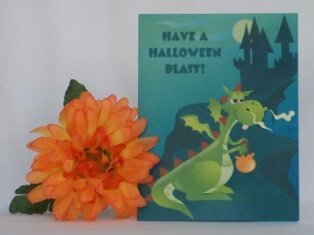 This card program has several Halloween greeting card templates to choose from but I decided for this handmade card making project, I'd combine one of the templates with one of the images included in the program. So for this Halloween card idea, I chose a Halloween card design that had a tree, bats and a vampire. I deleted the vampire image that was layered within the happy Halloween card. The program has graphic elements, like the vampire, saved in a graphics folder when you want to make your own cards and don't want to use their template. I copied the vampire image onto a blank card and printed it out. I carefully cut it out and adhered foam tape to the back and then taped it onto the card background. I taped the tree background over white paper so that the white paper framed the image. You can make the card from black cardstock for your homemade Halloween card ideas but you can tape black paper over white paper if you don't have a lot of black paper. 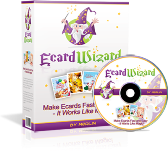 Click Here to Get Your Copy of Ecard Wizard! If you use one of the templates, it includes the sentiment inside the card so I decided to print it and then cut it out to include inside my handmade halloween card. For many of my paper card making ideas, I incorporate ribbon and for this handmade halloween card I made a knot on an orange ribbon, added a glittery brad over the knot. Many of my homemade greeting card ideas are used with scrapbook pattern paper but since this card making program has lots of patterns to make halloween cards, I just printed one out to use as the background. 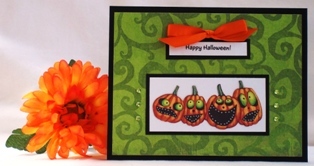 You can use the software program to make cards for Halloween or make a Halloween ecard as well. The software program also allows you to add sound to your ecard. Homemade Halloween cards don't have to be complicated when you have a software card making program that does most of the work for you. You'll be able to make lots of unique Halloween cards for friends and family.